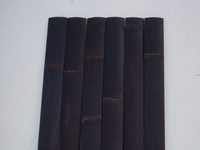 Home > Bamboo Slats > 50 Black Bamboo Flat Slats 1.75"x94"
50 Black Bamboo Flat Slats 1.75"x94"
These bamboo slats for sale are fully seasoned, fumigated & ready for your next project! Bamboo slats are commonly used for wall coverings, screening, bars, ceilings, wains coatings & so much more! * Natural bamboo slats harvested from the large diameter MOSO bamboo. The slats/planks are cut into strips along the length of the pole * Back side is precisely milled while the front maintains the natural bamboo beauty * Best quality in the world! * Fresh, hasn't been sitting around collecting mold * Commercial grade * Fumigated twice * Once urethane, will last quite well outdoors .